Born in April 1898, Herbert was the eldest son in his family, and consequently the first to attend Westminster School. He was admitted to Grant’s in 1912, and often took part in cricket tournaments, where he was a keen bowler. He left the school in July 1914 and enrolled in the Public Schools Battalions just a few months later. He was sent to the Western Front in November 1915 but returned to England the following year, having earned the rank of 2nd Lieutenant and transferring regiments. He transferred once more in 1916, moving to the East Surrey Regiment. With this regiment, he returned to the Western Front in August, before moving to Italy in November 1917. It was here that Todd was invalided, and he returned to England in 1918, receiving upon his return the Military Cross with bar and the Croix de Guerre. By August 1918 he had recovered, and returned once more to the Western Front, where he was killed just a few months later. Colin was the youngest son of Lieutenant-Colonel Edwards and his wife, Mrs Hyde Edwards. He joined Ashburnham House in 1909 and spent two years at the school, before going on to Bradfield College. On the outbreak of war, he attended the Royal Military College at Sandhurst, taking a commission as a 2nd Lieutenant in the 1st Battalion of the East Surrey Regiment in May 1915. He was reported missing on 8th May in the aftermath of the Third Battle of the Scarpe, but it was only established in September, 1917, that he had died of wounds as a prisoner of war on 22nd May that year. He has been wounded in action near Fresnoy and taken by the enemy to a war hospital at Shelotille, Douai. According the press-notice on his death ‘he was only 20 years of age, and had proved himself an enthusiastic young officer of the Regiment which his father was for so long associated’. 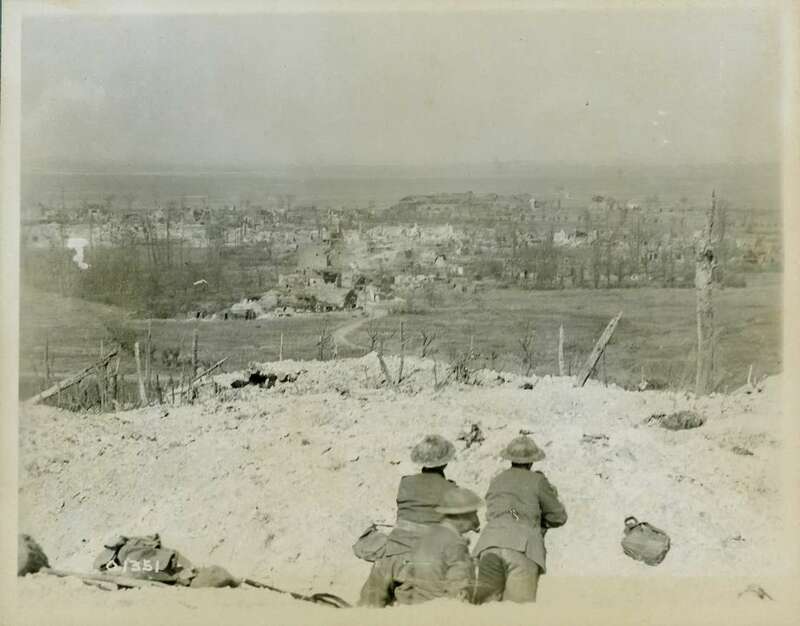 Soldiers overlooking the town of Douai, which remained in German hands until 1918. Edward Leach was born on 12th May 1891. He was the son of Arthur Francis Leach, a barrister from Kensington, and Emily Archer Cook from Brighton. 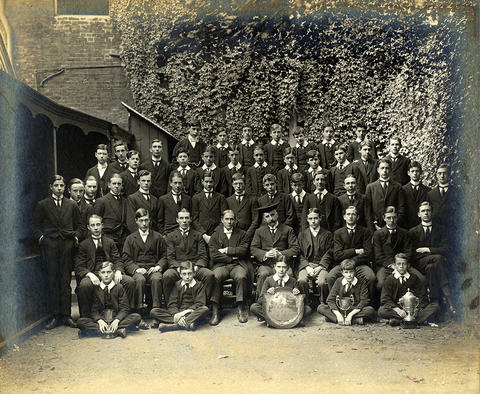 His brother Wilfrid John Leach was in his final year at the school when Edward arrived up Ashburnham in September 1904. Edward left Westminster in July 1908 and embarked on a career in the army. He arrived at R.M.C. Sandhurst in 1909 and was made 2nd Lieutenant, 1st Battalion East Surrey Regiment on the 5th October 1910. In March 1914, he was attached to the West African Regiment and was promoted to Lieutenant the next month. He served in the Cameroons from September 1914 until he was invalided home in February 1916. He had been acting as temporary Captain since September 1915, and was made Captain proper on 18th March 1916. He went out to France in March 1917. He was attached to the 7th Battalion East Surrey Regiment, and promoted to Company Commander. He saw action in the Third Battle of the Scarpe near Monchy-le-Preux. He was killed in action at the age of 26 on the first day of the battle: 3rd May 1917. Jack Buckman was the only son of James and Mary Jane Buckman, of East Dulwich, Surrey. He was born on 11th November 1892, and was sent to Fairfield Preparatory School in Southwark. His paternal grandfather had been a farm labourer, and his maternal grandfather was a rate collector. His father had worked hard to obtain a position as Borough Treasurer of Bermondsey; Jack’s parents’ decision to send him to Westminster was testimony to their ambitions for their son. By the time he arrived up Ashburnham in 1907, Jack was suffering from a health condition that prevented him from participating in athletics and other activities, including the OTC. However, upon leaving the school in 1910, secured a place to read Law at Wadham College, Oxford. He passed his prelims in February 1911, and graduated in June 1914. He was admitted to Middle Temple but, on the outbreak of war, decided to join the Army. He was placed on a waiting list following an unconvincing medical examination, but was soon posted as 2nd Lieutenant with the 8th (Service) Battalion, Gloucestershire Regiment, which was training near Salisbury Plain. He was awarded a first class certificate in musketry, and his leadership potential was judged to be such that he was sent on a special staff course at Camberley. Jack Buckman was killed in action at Flers, France, on 15th September 1916. His parents published a memorial in the London Times every year on his birthday, and on the anniversary of his death. George Rivers, often known to his friends as Charlie, joined Rigaud’s house as a day pupil in 1899, becoming a boarder in the spring, 1902. He played Cricket for his house and for a Town Boy team but with limited success as a batsman, scoring few runs and often being bowled out quickly. He also enjoyed gymnastics, but is described in The Elizabethan as ‘careful but lacks strength’. Nevertheless, he earned half pinks during his final year at the school. After leaving the school he went to work in Burma. He must have returned to London by 1913 as he married Miss Elsie Margaret Pickthall on 1st November and soon after the couple had a daughter. Once war was declared as he joined the Inns of Court O.T.C. and then took a commission as 2nd Lieut, 9th (Service) Batt. the East Surrey Regiment just before Christmas 1914. He was a ‘Grenade Officer’ — in charge of the bomb throwers within his battalion. Rivers was killed in heavy shelling on the part of the enemy near Trones Wood during 21st August 1916, along with three other men from the regiment. Noel Marshall Vernham was a member of Rigaud’s house from 1910 until he left to join the army after the outbreak of war in 1914. Whilst at the school he was an accomplished gymnast, helping Rigaud’s to secure second place in the Senior House competition and representing Westminster at Aldershot. He was also represented the House at fives and football. Vernham’s athletic antics appear to have got him into some scrapes — in July 1913 he broke his nose, but made a speedy recovery and in November 1913 he injured an eye. He took part in the Officer Training Corps and advanced through the ranks whilst at school, helping to prepare himself for his military career. Initially he enlisted in the Middlesex Regiment, but was transferred to the East Surrey Regiment in March 1915. He first went out to the western front on 19th March 1916. SIR,—With reference to the death of 2nd Lieut. Vernham, I wish to describe what I saw of it. 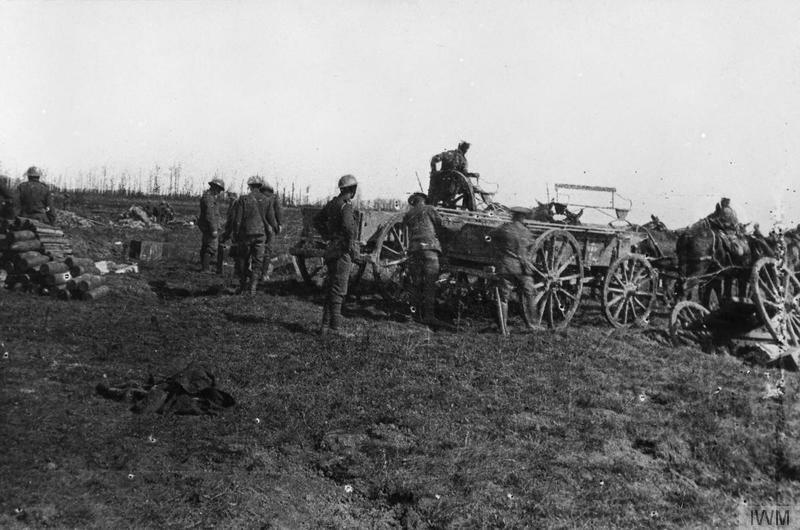 At 4 a.m. on the morning of July 28 the regiment proceeded into action at Longueval. Mr. Vernham was then commanding No. 14 Platoon, No. 4 Company. 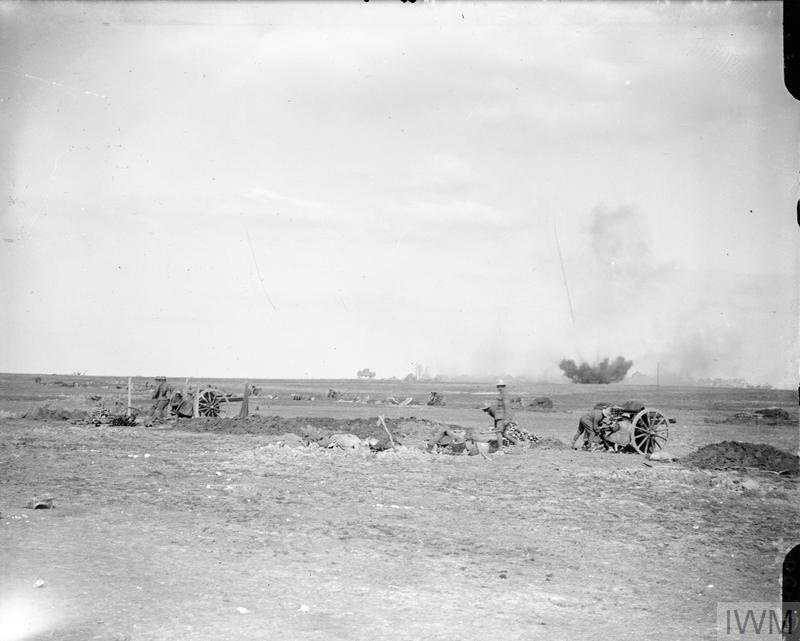 This platoon was immediately in front of me in a communication trench, which was being very badly knocked about, owing to the very severe shelling which was prevailing at the time. Mr. Vernham, however, highly indifferent and utterly regardless of all danger, stood and walked about on top of the trench, organising and generally looking after his men. He stood on top that he might more easily do this, fully aware that every second his life was in danger, as there was no pause whatever between one shell and another. However, he was not the least disturbed, but added greatly to the safety of his platoon by moving them every moment to places of safety (such places as existed); of these, there were very, very few. About 5.30 a.m. to 6 o’clock he was killed by a very powerful shrapnel shell which burst above his head, a piece striking him on top of the head. Death was instantaneous. Owing to his bravery and zeal and continued thought of the welfare of his men, his platoon looked to him as their chief protector and thought the very world of him. It was chiefly owing to his zealousness and great care for his men that he met his death in this way. 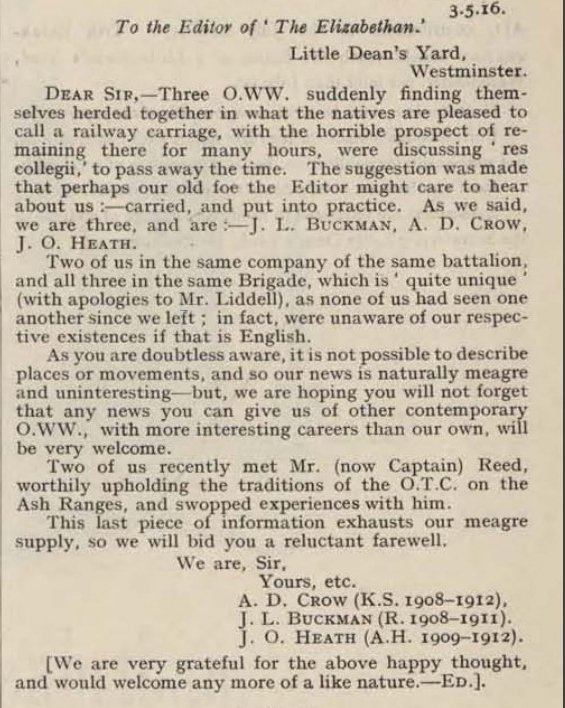 I can assure you, his loss was felt very acutely by his company, more especially by the platoon he commanded, and they offer their deepest sympathy to you in the loss of such a gallant son. His body was buried at Longueval. 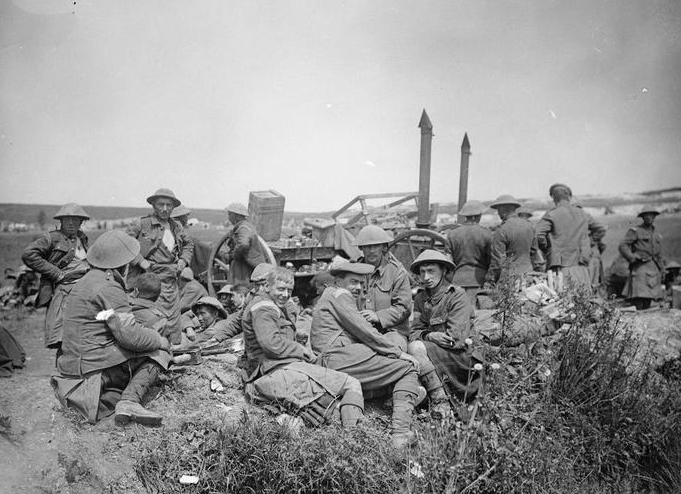 Black Watch back at rest after delivering a counter-attack at Longueval on the morning of 19th July 1916.